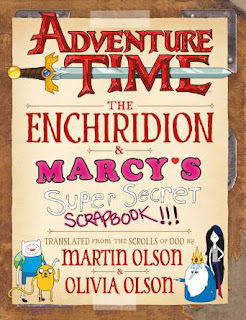 Dive deeper into the mysterious Land of Ooo with this extra-special mash-up of The Enchiridion (the ancient hero's handbook, as featured on the series) with Marceline’s private scrapbook. This in-world compendium of all things Ooo is written by the father and daughter team behind the voices of popular Adventure Time characters Hunson Abadeer and Marceline the Vampire Queen. It features full-colour illustration throughout and comes from the same creative team behind the New York Times bestselling Adventure Time Encyclopaedia. Olivia Olson is the daughter half of a father/daughter creative duo and an actress, singer - songwriter and recording artist. The pair have written music together for over fifteen years and lend their voices to Adventure Time's father - daughter characters Hunson Abadeer and Marceline the Vampire Queen. They live in LA. Martin Olson is a comedy writer, television producer, stage director and composer. He is best known as a “founding father” of the Boston comedy scene, and he has received an Emmy nomination and Ace Award for television writing. The Enchiridion & Marcy's Super Secret Scrapbook comes out on 4th March.